A nationwide strike in France has seen thousands of people march instead of going to their regular jobs on Thursday. The union-led protest affected public services, air traffic, radio broadcasts and Paris’ most-famous landmark. The strike is a day after President Francois Hollande's government said it expected one percent economic growth this year and lowered its forecast for 2016 and 2017. The unions are protesting against budget cuts and a number of other grievances they have against the government or employers. Thousands of protesters marched in Paris between Place d’Italie and the Invalides. There were some 70 demonstrations across France, with an estimated 7,000 people taking to the streets in Marseille, 10,000 in Bordeaux, 8,000 in Toulouse, 7,000 in Lyon, 5,000 in Rouen and 3,000 in Nantes, according to The Local. The slogan the union leaders chose for the protests was “Maintenant ça suffit!” (“Enough is enough!”) FO union leader Jean-Claude Mailly said. 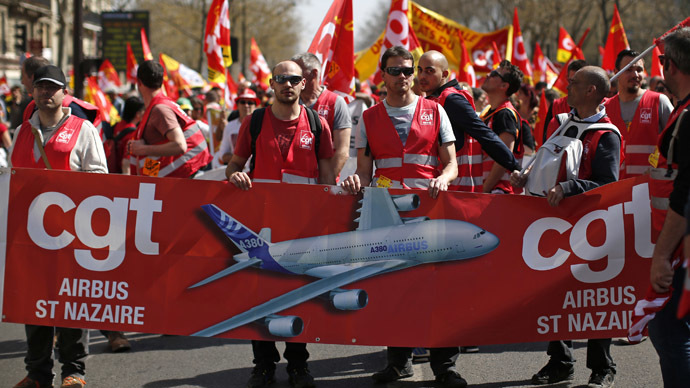 "For months we have tried to explain to the government that it must change its economic policy because the effect of austerity is impacting on employment, public investments and wages,” Philippe Martinez, general secretary of the CGT union federation, told France 2 TV. Air traffic controllers want better work and retirement conditions, and their protest started on Wednesday. Airlines had to cut almost half of the flights to and from France during the two-day strike. Hundreds of flights have been affected. Hospitals, schools and other public services had to scale down on Thursday as staff walked out. Some schools substituted teaching with other activities and kept their doors open. The employees of the Eiffel Tower locked the doors until the evening in solidarity with the protest. A number of marches have been held across the country with the biggest expected later in the day in Paris. The protest however was not supported by one of France’s largest trade unions the CFDT, which said the country’s austerity measures are far from being as bad as those imposed on the people of Greece, Spain or Ireland. President Hollande's government has vowed to cut the budget deficit to a level permitted by EU rules by late 2017 when his term in office ends.